I've always been intrigued by the ever changing breakdown of species that inhabit my back garden. Over the years a number of large trees, mainly European species have been removed and others, mainly West Australian eucalypts, have supplanted them. The movement of the 70s and 80s encouraging householders to 'go native', have seen many changes to mine and the surrounding gardens. The downside of this has been that, as the trees and shrubs have matured, a few species have dominated. Gone, except as very occasional visitors, are the smaller honeyeaters that frequented this area, particularly in the Winter, replaced by the 'bullies', the Little Wattlebirds and the Noisy Miners. A few others manage a living, Musk Lorikeets, Eastern Rosellas, the odd Crescent Honeyeater, and even an occasional (and welcome) Yellow-tailed Black Cockatoo. Of course, we have almost the full range of exotics too! 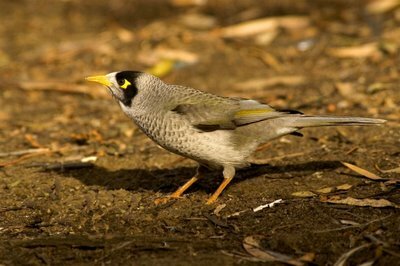 The Noisy Miners started using the garden in numbers, in the mid 80s, and now are regular visitors, harried, but unbowed, by the resident breeding pairs of Little Wattlebird. The Tasmanian sub species of the Noisy Miner, is substantially larger than the its Mainland cousins (Bergman's Rule kicking in). Perhaps that goes some way to explaining why the Noisy Miner I photographed this morning (top right) in a beachside car park, was drawn to a discarded meat pie, although I couldn't determine whether it was eating the meat or the pastry!